After more than 10 years since her last foray into the talk-show world, Queen Latifah (a.k.a. Dana Owens), the 43-year-old actress, Cover Girl spokeswoman and former rap artist, has returned older, wiser and ready to inspire. The Queen Latifah Show’s inaugural outing could have just been called Queen Latifah and Friends, but who could begrudge the Queen the fact that she would want to gather her nearest and dearest to celebrate her new start? Latifah has said in recent interviews that she wanted her new series to be more positive and optimistic than other talk shows, even her own that ran from 1998-2001 (and not be the kind of show that incorporates those dramatic paternity tests). So far it seems to be working. Latifah laughs and jokes and joshes around through her opening sequence, and that, combined with the warm, autumnal colors of the set (designed by Lenny Kravitz), evokes a cozy and genial feeling. She also seems to be borrowing a leaf from Ellen DeGeneres‘ playbook by dancing at the start and end of the show, as well as with her guest (friend John Travolta, whose Saturday Night Fever look she copied in her wardrobe choice). Later though, Latifah extended even more generosity to the students and their beloved teacher, Vince Womack, by sprucing up their music room and bestowing them with new instruments (while wearing a confoundingly configured dress). 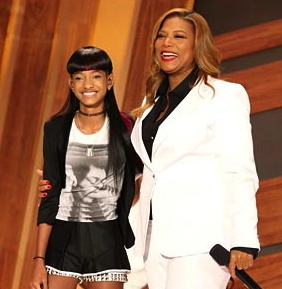 It was a teary segment that sets the tone for Latifah’s inspirational approach to her series, and her openly counting her blessings while thanking her audience for being with her through these exciting times (her enthusiasm for her own show is hard to ignore) felt, again, a lot like Oprah in spirit. But Latifah is — as Travolta said of her while lavishing her with praise — a “light,” and someone who fills up a room with her presence. She’s also energetic and sincere. Her showrunner, Corin Nelson (a veteran of many talk shows, including Chelsea Lately, The Rosie O’Donnell Show and The Nate Berkus Show) should be able to help steer the series in the right direction as it settles into its first week. Capitalizing on Latifah, though, should be paramount, and the one thing that might make it stand out would be more segments dedicated to her discussing current issues, showcasing her personality. It is Latifah herself who can elevate the series from just another afternoon talk show to something worth tuning in for. Overall, she is off to a decent start. Willow fake accent. What’s the point? Think she’s trying to sound like Rihanna. What was that? She didn’t have that accent when she sang “Sling My Hair”.